The Whole Tungsten FDG Pig is available in wide variety and advanced range. This type of metal pig, which is also known as the ''radiation shielding'', is widely fits in the normally used formulaic and the safety syringes. 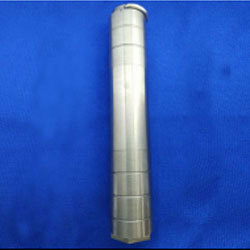 This Tungsten Syringe Shield of 14 mm - 45 mm is manufactured by using optimum quality ASTM tungsten class 3 metal with the help of latest technologies. The Whole Tungsten FDG Pig possess rigidity, it is sturdy in nature and can be cleaned very easily. It find its applications in pharmaceutical industry and can be accessed by our clients.